Here are the tips, tricks and what to expect whenever you see yourself booked on a flight in Swiss’ 777 business class. Swiss features a modified Thompson Aero Vantage seat on their 777s, arranged in either a 2-2-1 or 1-2-2 configuration. As you can probably already tell from the above configuration, there are seats to love and seats to hate. Before, the prize pick would undoubtedly be one of the throne seats, though unfortunately now they come at a price (how did I not write about this back in February?) – a rather hefty one at that, at HK$800-HK$1600 per flight, unless you have HON Circle status (in which case it’s free). I’d think it’s worth it if you’re flying Swiss business class as a once-in-a-lifetime experience, though I guess I’d recommend against it if you commute in Swiss business class on a regular basis. For more discussion on the best seats to pick, stay tuned, as I’ll talk about that in a bit. Every seat reclines into a flat bed that is pretty wide and spacious. In this configuration (I’ve only flown it on Swiss before) I’ve generally heard that the throne seats have limited foot space, which I haven’t found to be the case on the two flights I’ve taken in throne seats on a Swiss 777. The seat is equipped with a massage function, though I’ve found that to be largely useless, unfortunately. You can also control how soft you want your seat to be in a seat control pad located underneath the armrest. For those wondering, the seat also has a “relax” mode, though I haven’t used it much, as I’ve found it too low for working and too high for actually relaxing and watching TV (though some may think otherwise). Which seats are top picks? I’d say that if you get a throne seat for free, you should absolutely go for one, as they feature a crap ton of storage space. You get a window, as well as a few storage space options such as a drawer (which I’ve found to be really helpful at most times). These seats are: 4A, 7A, 9A, 11A, 14A and 16A, as well as 5K, 8K, 10K, 12K, 15K and 17K (4A and 7A are the prize picks, as their foot cubbies cut into the bulkhead and are thus extra expansive). However, these seats will cost a fee to reserve from here on out, which is definitely sad. However, if you don’t need a window and you’re travelling solo, the seat I’d otherwise recommend is the center seat that isn’t exposed to the aisle. In each block, one center seat is directly exposed to the aisle, whereas the other one isn’t (there’s a partition between them). As you can probably note from the above picture, seat 4D features nothing next to it, while seat 4G at least has a little storage area next to it great for placing a toothbrush or something. You lose the drawer that you’d normally find in a throne seat, but the compartment is better than nothing. Also, you have direct aisle access, and you won’t be climbed over by anyone – there’s also sufficient head privacy so you won’t be exposed to the aisle while you’re sleeping. Seat 4G also has the right side platform to itself, so if you sit there, you’ll be able to place your open laptop next to you while you’re eating or leaving your seat, etc.. These seats include all odd-numbered D seats and all even-numbered G seats. If you want a window seat for free, I’d say that the pair window seats aren’t too bad a pick, though there are two caveats – firstly, you’ll have to climb over your aisle seatmate to use the washroom, which can be a huge pain considering the amount of space in between the seats (at least in “normal” forward facing configurations, you only have to step right next to the seat beside you), and secondly, there isn’t much storage space at all, limited to two rather shallow cupholder-like compartments that won’t be useful for storing bigger items. Finally I’d pick the center seats exposed to the aisle over windowside aisle seats, as at least no one needs to clamber over you while you’re sleeping. However, overall I do believe that you will have a pleasant experience no matter which seat you pick. If you’re traveling with another person, my pick would depend on if you would appreciate a window view or more storage space; while you benefit from window views if you fly in one of the window pairs (and trust me, that can be a very good thing if you’re on a daytime flight arriving into Zurich or Geneva if the weather cooperates), you lose the extra storage space you would otherwise get in one of the two middle seats. Furthermore, you won’t run out of power at the seat with a USB and 110V power port, and the entertainment system navigation is great, though the selection overall is lacking. What Food Should You Order? I don’t really have concerns over this, as food that I’ve had on Swiss is consistently amazing. I would actually recommend asking a crew member for their recommendation if the crew on your flight seems especially engaging. The last time I did so I was recommended the chicken, which was probably the best thing I’ve ever had on a flight to date. It’s worth noting that their breakfast service isn’t as spectacular – it usually involves a spread of bread, cold cuts, muesli, yoghurt, an egg dish and a drink. The bread, cold cuts and yoghurt are usually fine, the muesli is usually soggy, and the egg dish can range from good to subpar. The first time I flew Swiss I had a weird scrambled egg-stuffed crêpe, while I’ve had an omelet of some form on my other two flights with them. I’d love to see some variety in their hot dishes – waffles or rice sound compelling. I’m not asking for an eggs benedict, but these egg dishes are rarely ever executed perfectly on the plane. I do like Swiss’ sausages, though. Swiss provides a range of amenities within their business class product. The pillows I’ve had on Swiss are some of the better pillows I’ve had across any airline, though the blanket certainly could be thicker, or at least quilted. The blanket seems slightly underwhelming compared to what you’d be able to find across other business class products. Swiss’ business class product features an amenity kit that features all the basics – toothbrush, lip balm, an eye mask, etc.. However, I do wish that there was some consistency to the packaging that the amenities were provided in. On my first flight I was provided a rather legitimate pouch, on my second flight the amenities were provided on some form of a tote bag, and on my most recent flight, they were provided in a neck warmer. WTF? Swiss also provides their passengers with substantial headphones, which I certainly appreciate. They’re not noise-canceling or Bose quality, but they do the trick. Overall, while I wish Swiss’ business class product provided a thicker or quilted blanket, I’m generally happy with the amenities provided. I’ve found service on Swiss to be consistently friendly. On my most recent flight, the flight attendants were superstars and even aided me with my tour around the plane. On the other two flights that I’ve taken on them the flight attendants seemed unsettlingly flustered, though they had only started operating the 777, so I’m more lenient towards that. Swiss’ service ethic is certainly more reactive rather than proactive, which I appreciate as long as the flight attendants seem happy to be working the flight. They usually disappear into the galley as everyone goes to sleep, and reappear during the second meal service. I have no complaints with that and even prefer it in a way, as it means less foot traffic. Which lounges can you use? Swiss has a phenomenal international business class lounge in Dock E, where most longhaul flights are operated out of. The lounge features great food, work cubicles, showers, a variety of seating options, and most importantly, an outdoor terrace that overlooks the tarmac. 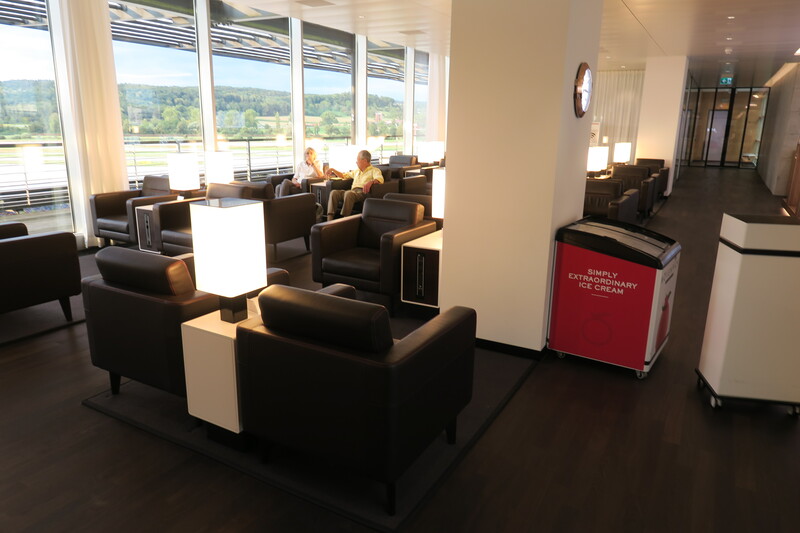 I’ve reviewed the other two lounges that Swiss offers in Zurich (Terminal A and Terminal D), though you’d most likely have access to the Dock E lounge if you were flying out of Zurich on a 777. If you’re flying out of Geneva, you have access to a rather nicely decorated lounge which is usually rather crowded, though still features decent seating options. I’ve yet to visit any of Swiss’ other lounges (which are situated in Chicago and New York), so I can’t report back on them – they seem similar to Swiss’ lounge in Geneva or Swiss’ Terminal D lounge at Zurich. If you’re departing from Hong Kong, you have access to the Singapore Airlines lounge, the United lounge, the Thai lounge, or the two Plaza Premium lounges located in Hong Kong.If I were you I would head for the United lounge, as the Singapore Airlines lounge is usually hellishly crowded before the SQ 2 departure to San Francisco. Since both Plaza Premium lounges offer spaces dedicated solely to airline invited guests, I wouldn’t consider them bad options either (just note that Swiss flights normally depart near gates 22 and 24, so they’re quite a haul from the United, Thai and Plaza Premium West lounges). Overall I think that Swiss offers a solid business class product on the 777. 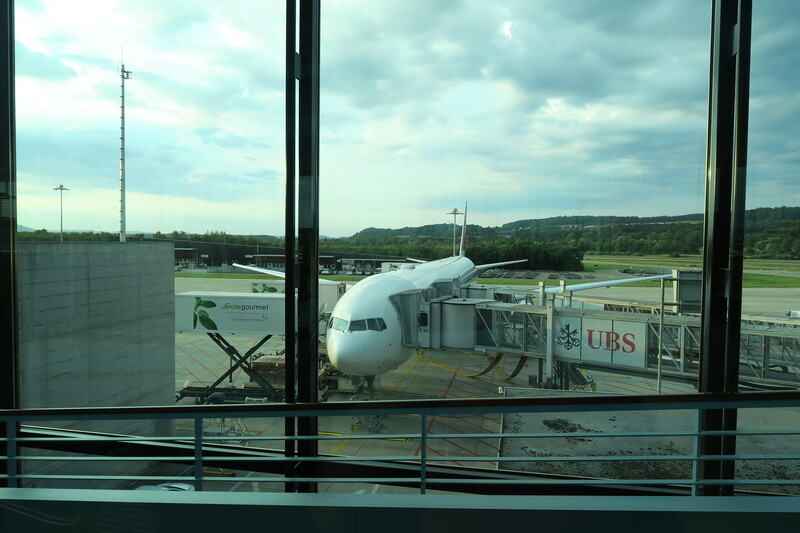 I love their Zurich lounge, and the opportunity to spend time with planes on the terrace is probably a reason to arrive the airport early (though Zurich is one of the travel destinations I can’t wait to spend more time in). Despite the great food and service, however, I don’t think the product itself is worth going out of your way for. It’s worth noting that Swiss usually charges obscene prices for their business class product, so you’d want to redeem your flight with Star Alliance miles.